My fond feelings towards the Sandy Gorge trace back to my first run through the gorge. I was scouting potential runs for commercial rafting and the guidebook made the gorge sound interesting. I was in town from Colorado so I didn't have any boating partners but figured I'd go slow and scout by myself and probably be o.k. I have memories of leaning out over a 50 ft. cliff trying to scout Boulder rapid, and being overwhelmed with the magical feeling of being in this beautiful place. After well more than 50 runs through the gorge, I still love the feeling of isolation and beauty of the gorge. Although the rapids can hand out a beating, they are generally easier than they look if you know them a little. This is truly one of Oregon's classic boating runs. In 2007, the Marmot Dam and the Little Sandy Dam were removed. Currently, the BLM is close to finishing development of the old Marmot Dam site for recreation but the some of the area remains off-limits to vehicles. Eventually there should be good access for beginning or ending a trip as well as other rustic amenities. There are a few possible put-ins for this run. I usually put-in just below '64 Logjam rapid. Although this rapid is being run more often lately, I've never thought it really added much to the run. Below '64 Logjam the river consists of classic Class 3 boulder gardens set between cliff walls that rise 50-100 ft. on either side. The rapids generally get harder as you progress downriver but there is always a good recovery pool below each rapid. When Badger Creek enters on the left about 3 miles from the '64 Logjam put-in, get ready for Boulder rapid. There is also a prominent rock outcropping on the left at Badger Creek. Below Badger Creek there is a long rapid that ends in a big pool above Boulder rapid. Boulder is unmistakable and one of the coolest places I've seen on any river. There are two distinct lines at Boulder. Most folks take the narrow right side slot but there is also an interesting left side line. Boulder can be portaged by staying far left until you run out of water. If you decide to run the left, scout carefully, as the right side of this slot is undercut and has a rock sieve about halfway down. Shortly after Boulder is Rasp Rock rapid. Rasp Rock begins with a river-wide ledge that is usually run down the middle. About 30 yards after the ledge the river narrows dramatically and is divided by 2 large rocks into 3 slots. Rafts will want to take the middle slot but canoes and kayaks can run any of the slots, although the right slot is easiest. Rasp Rock rapid can be scouted from either side of the river by eddying-out after the ledge. Drainhole is next up. Here the river starts out left, slams into a huge boulder and takes a 90 deg. turn to the right. The trick is to start left and then cut right to avoid the boulder and the hole immediately next to it. This is easier than it looks but gives a lot of boaters the heebie-jeebies. Scout Drainhole from either side of the river. It is easy to avoid the whole rapid by portaging a short distance over the gravel bar on the right. After another 1/2 mile of gorge scenery, the gorge opens up as the river flattens out. Don't relax too much as Revenue Bridge rapid is only another 1/4 mile downstream. Revenue seems to change a little bit each year but there is usually a tough line down the far left side, and a couple exciting lines through the rocks in the middle. Either way you go it helps to stay upright. After a short pool, the river drops through some fun, big holes and finally calms completely under Revenue Bridge, the take-out. The Sandy Gorge has a reputation for handing out some beatings in recent years. This is a shame because the majority of the run is very enjoyable Class 3-3+ rapids and incredibly scenic. The major rapids, Boulder, Rasp Rock, Drainhole, and Revenue Bridge, should be scouted. 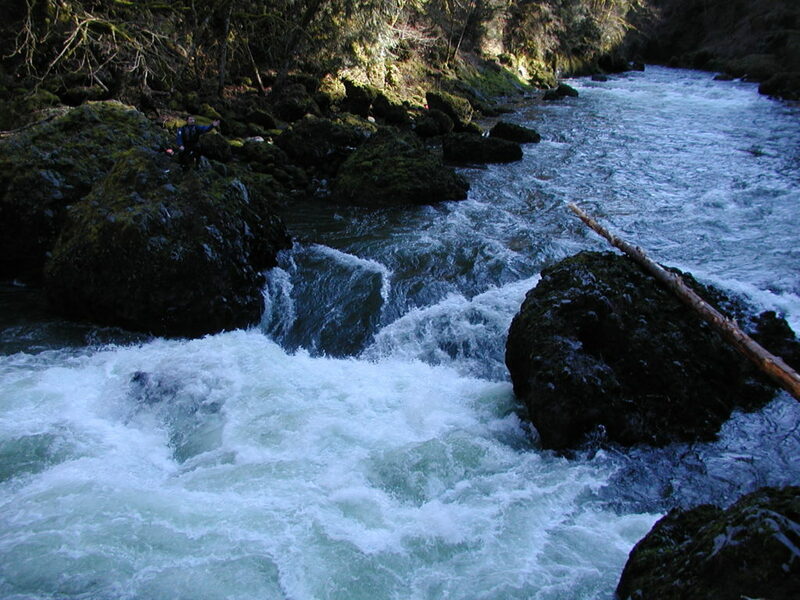 The first 3 major rapids tend to collect wood which may completely block the rapid. Boulder Rapid can be scouted on the far left under the overhanging cliff wall or from the center gravel bar at some flows. The right slot can be scouted by scaling up the steep river-right slope just upstream of a huge boulder in the entrance pool. Boulder can be portaged by staying far left until you run out of water. Rasp Rock is easiest to portage on the right side. Drainhole is easiest to portage on the right across a short gravel bar. If the exit slot is blocked at Drainhole, it is possible to portage the whole rapid on the left. Revenue Bridge rapid can be avoided by taking out on the left and walking up to the bridge. It is best scouted from the bridge before starting the run. From Portland, head east on US 26 to Sandy. From the junction of US 26 and Oregon 211 in Sandy, head east for several blocks and turn left toward Bull Run and Oral Hull Park on Ten Eyck Road. This road switches back down into the Sandy River Canyon (take a hard left at the first "Y") and goes across Revenue Bridge, the take-out. Much of the historical parking at Revenue Bridge was eliminated when the bridge was rebuilt. Currently, most boaters are parking at the end of Kubitz Rd which is about 100 yards to the west of Revenue Bridge. From the take-out at Revenue Bridge, drive north on Ten Eyck Road for 100 yards and stay straight at the next intersection and continuing on SE Marmot Rd for about 4.3 miles. Turn right on this gravel road and follow it downhill for about 1.3 miles. Reach the put-in downstream of '64 Logjam rapid by hiking down the closed road about 50 yards and turning onto a trail on the left just before the road turns right. The trail divides and ends at two possible, steep trails down to the river. There is also a trail down to the river just above '64 Logjam rapid. To reach this trail continue on the main road to the next gravel road to the east on the right. The trail begins at the end of this road. There is currently a gauge (Sandy River near Marmot) which is near the old dam site put-in. The gorge gets progressively harder as the flow increases. At flows over 4000 the run is 4+ with large holes and turbulent currents. Rafts: The Gorge is best for rafts over 1500 cfs. At lower levels it is difficult to get down Revenue Bridge rapid. Check out Jason's description of this run.